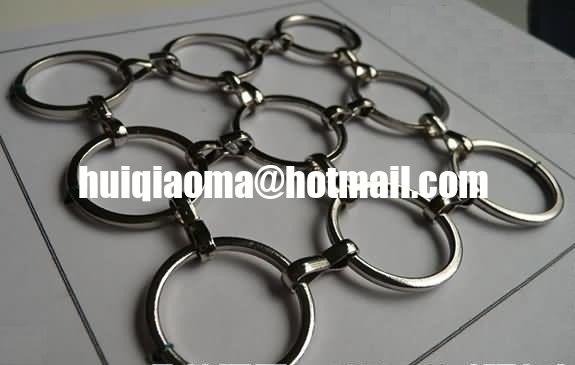 Metal ring mesh, made of carbon wire or stainless steel wire, is composed of one big ring and a "S“ type connect piece. It is another kind of new decorative materials in the modern architectural design territory. Our ring mesh can be galvanized with various colors and shows an imaginary and elegant atmosphere. Ring mesh, With its versatility, unique texture, variety of colors, durability and flexibility, are widely used as isolation wall, widows screen, banister fillings,clothes frame and has been more used by designer in the interior design. 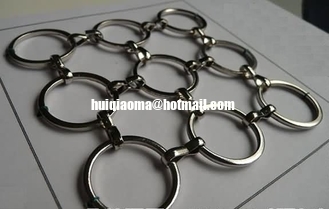 The Ring Mesh is usually fixed with an stainless steel or aluminum alloy frame. Around the ring mesh, we can fix the " S " type connect piece with one round wire, which wire is welded on the frames. and then install the frame on windows or isolation wall with screw or others.